The Archdiocese of Philadelphia is celebrating an Extraordinary Year of Mission beginning in October. A blessed statue of Saint Paul will be traveling to the homes of our Parishioners for a week-long visit. The statue of Saint Paul will be traveling for one year from household to household. You are invited to bring the Statue to your home. This is a unique opportunity for you to have special prayer time. Each day you are asked to say the simple devotion which will be provided. Traveling devotions help keep prayer and spirituality close to home for many. Usually the statue is transferred over the weekend at church. 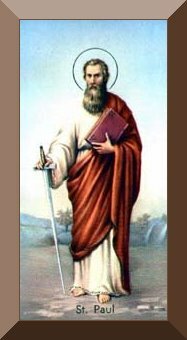 If you would like to host the Statue of Saint Paul in your home, please fill out the form found in the bulletin. You will be contacted with detailed information.